VOILA MY OWN DIY SPORT-BRALETTE!!!!!! A Bralette is a great combination of a bra and camisole. However, I have issues with wearing Bralettes due to comfort/support and the fact that it’s difficult to hide bra straps. A sports bra is a great combination of comfort and support, but they often lack style. 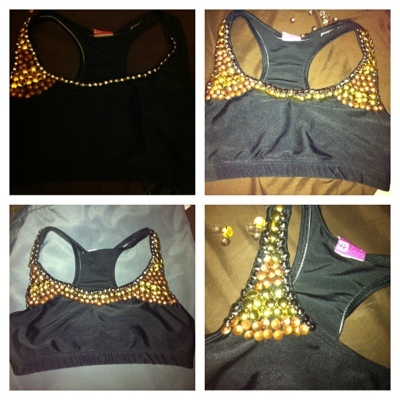 Recently, I had the idea of jazzing up a sports bra by adding studs. 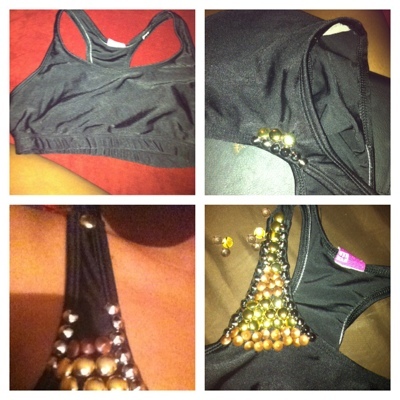 I took some inexpensive studs I found on eBay and added them to a Nylon sports bra with a freehand design…..and VOILA MY OWN DIY BRALETTE!!!!!! Decide on where your want to add the studs. Simply push the prongs of the stud through the fabric. Keep in mind that you might struggle a bit if the fabric is thick and might have to use sharp pointy object to make incision. Then simply bend the prongs down with your fingers. Check and make sure that the studs are secure and carry on with the similar process. This entry was posted in DIY (Do It Yourself), Thrift-Nista and tagged beauty, blackandwhite, bralette, Clothing, croptop, Design, DIY, Do it yourself, eBay, etsy, Fashion, Hiaddie, Shopping, spike, sport bra, stud, Style, top. Bookmark the permalink.